The purpose for which this church is formed is to corporately and publicly worship, praise, glorify and give thanks to the triune God: Father, Son, and Holy Spirit; to minister the Word of God to believers; to promote fellowship among the body of Christ; and to promote evangelism at home and abroad. True Vine Christian Ministries is a multicultural, independent church. It is our purpose to be unhampered by the restrictions and decisions of other churches or denominations that would determine the ministry and message of our church. Since we believe that the Bible is Gods holy inspired Word, it is our purpose to draw from the Scriptures the principles that determine our beliefs and practices. As the name implies, it is the Word of God rather than the word of men that ultimately directs our church. It is our purpose to meet frequently for worship, instruction, fellowship, and outreach in accordance with Acts 2:42. The message we declare to young and old alike is based upon a literal, grammatical, and historical interpretation of the entire Bible. We proclaim the truths of the Bible, being confident that God is glorified and mans needs are met when His truths are presented and obeyed. 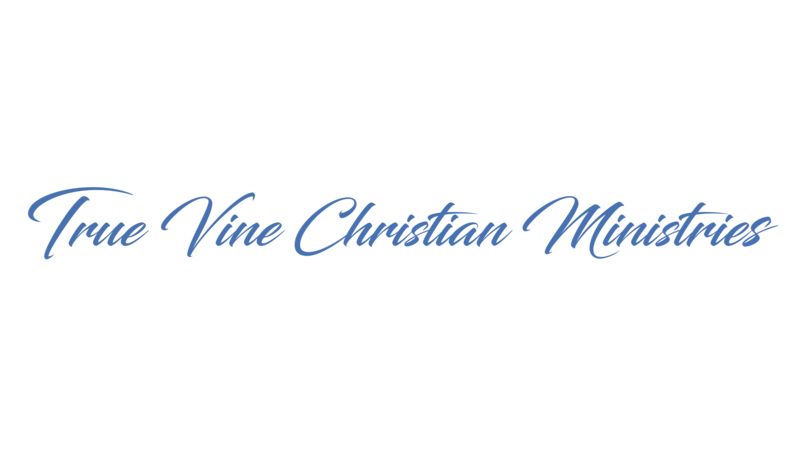 We further believe that because True Vine Christian Ministries is a body of believers, it is the mission of this church to make disciples. In keeping with Acts 2:42, this church has four major areas through which it fulfills its mission in the world. Worship, which has as its primary goal expressing to God the esteem which His people hold for Him. Christian education ,which promotes learning among Gods people and a response of personal obedience to the Scriptures. Outreach, which touches the world at large with the Good News of Jesus Christ and the salvation He offers. Each of these four areas is designed to provide a distinct, divine option to the worlds approach to living, starting within the church and extending to society at large. Since True Vine Christian Ministries believes that each member of the body of Christ has received from the Holy Spirit spiritual gifts which he/she is to discover and develop, it is our goal to see that these gifts are exercised, thus contributing to the life of the body. We believe in the sovereign and triune God--the Father, Son, and Holy Spirit--who created the universe and our world by His power and out of nothing, and in the beauty and perfection of His goodness. We affirm the literal, historical, and biblical creation of Adam and Eve in the image of God, in righteousness, holiness, and truth, whose natures were without sin. We believe that through Adam mankind has fallen into sin, and now in a state of depravity and disobedience, all men are born sinful and naturally estranged from God and live in a world thoroughly corrupted by sin. We therefore affirm the need for all men to be redeemed from their sins and we confess that men, though fallen and depraved, are precious in the sight of God. We believe that God the Father sent His Son, incarnate and virgin born as Jesus of Nazareth, the Christ, to pay the penalty for sin and earn forgiveness for those who trust in Him as Savior. We affirm His resurrection which guarantees our eternal life; His mediation and prayerful intercession on behalf of all Christians; His reign as Lord at the right hand of the Father; and His real, visible, and physical return to earth, in time to come, to judge the living and the dead. Thus, we affirm mans importance by believing that all men are responsible to God and they are called upon to repent of their sins and believe in Christ. We believe in the Holy Spirit, who is God, the third person in the trinity. We believe in His divine work in converting sinners by His grace through the gifts of repentance and faith. We believe in His sanctifying work in all true believers which changes them to become more like Christ. We believe that the Holy Spirit guides, guards, and grows the Church of Christ and will bring all things to both completion and perfection according to the will of the Father and the work of the Son. We affirm that the Spirit indwells every Christian. We believe that the Bible is the Holy Scriptures of God and is infallible because it cannot err, and inerrant because it has not erred in all that it states. The Bible is inspired by God, sufficient for all matters of faith and goodness, authoritative over all men, and relevant to every age. In both its law and its gospel, it proclaims salvation by grace through faith and sets what men must believe about God and what God requires of man. We believe in the Church of Christ, set forth in Scripture as the communion of all true believers worldwide, and in particular, of the voluntary assembly of Christians in local congregations. We affirm that every believer and Christian household should unite with, support, and be active in a local Bible-believing, Christ-honoring church that affirms the historic faith of Christendom. We believe in the means of grace given to the church--the Word, Prayer, the Lords Supper, and Baptism--and believe that these ordinances are to be kept faithfully until Christ returns. We believe that every local church has an important responsibility to nurture, instruct, and guard the children of the church in the love of Christ. We believe in the immortality of the soul, in a real and literal heaven, as well as an actual hell. We believe in the resurrection of the body, the judgment of the world by Christ, and the eternal reward of the believer along with the eternal punishment of the unbeliever. We affirm that human life is too precious a gift to be left to destruction and thus, we proclaim the Gospel of Grace in the hope that mankind will be saved. We believe that one cannot enter the kingdom of God unless born again spiritually, and that the salvation of the believer comes only through faith in the Lord Jesus Christ, the Son of God. We believe, also, that our redemption has been accomplished by the atoning death of our Lord Jesus Christ and that this redemption is an act of grace, an unmerited gift, given in love by God and not the result of any human works. We believe that upon receiving the Lord Jesus Christ by faith, the believer passes immediately out of spiritual death into spiritual life, and into fellowship with God. We also believe that once this salvation is accomplished, we and all true believers everywhere shall be kept forever. We believe that Christian baptism is the immersion of a believer in water in the name of the Father, the Son, and the Holy Spirit. It is an act of obedience symbolizing the believers faith in a crucified, buried, and risen Savior, the believers death to sin, the burial of the old life, and the resurrection to walk in newness of life in Christ Jesus. It is a testimony to his faith in the final resurrection of the dead. Being a church of ordinance, it is a prerequisite to the privileges of church membership and to the Lords Supper. The Lords Supper is a symbolic act of obedience whereby members of the church, through partaking of the bread and the fruit of the vine, memorialize the death of the Redeemer and anticipate His second coming. We believe that God is the source of all blessings, temporal and spiritual; all that we have and are we owe to Him. Christians have an obligation to share the gospel with the whole world, a holy trusteeship in the gospel, and a binding stewardship in their possessions. They are therefore under obligation to serve Him with their time, talents, and material possessions; and should recognize all these as entrusted to them to use for the glory of God and for helping others. According to the Scriptures, Christians should contribute of their means cheerfully, regularly, systematically, proportionately, and liberally for the advancement of the Redeemers cause on earth. Join us on May 14th for Mother's Day. Mothers are a ministry from the Lord.